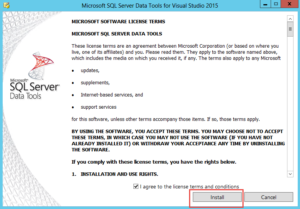 In a long overdue move Microsoft has drastically changed the installation process for SQL Server Data Tools with the SQL Server 2016 release. In the past, SQL Server Data Tools was the name of two separate and quite different products. One of them was the descendant of the Business Intelligence Development Studio (BIDS) which was last officially part of the SQL Server 2008 and SQL Server 2008 R2 release. The other was the descendant of a project called Data Dude. In spite of sharing the same moniker, each of these tools had very different purposes. The BIDS project became known as SQL Server Data Tools-BI (SSDT-BI) and it was used to develop Analysis Services projects, Integration Services packages and Reporting Services reports – all vital to SQL Server BI subsystems. The Data Dude project became known as just SQL Server Data Tools (SSDT) and it was used for data and schema compare as well as versioning and other database development. 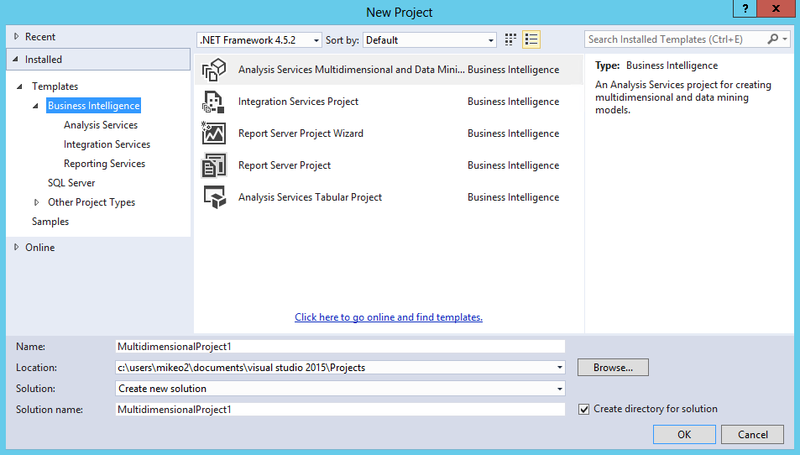 With the SQL Server 2016 release the former Data Dude capabilities have been incorporated into the main Visual Studio family and the BIDS feature set is now the new SQL Server Data Tools (SSDT). Getting the new SSDT is now more straightforward than in earlier releases as well. 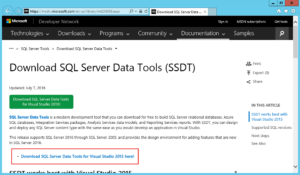 You can download SSDT directly from Download SQL Server Data Tools (SSDT) or you can also download it using the Install SQL Server Data Tools link on the SQL Server 2016 Installation Center. 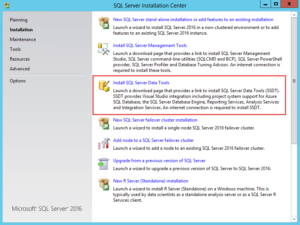 You can see the SQL Server Installation Center’s installation option for SQL Server Data Tools in Figure 1. 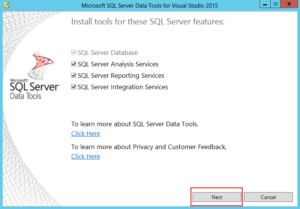 Clicking the Install SQL Server Data Tools link opens a browser window and takes you to the Download SQL Server Data Tools (SSDT) dialog that you can see in Figure 2. This is the direct download page that was mentioned earlier. 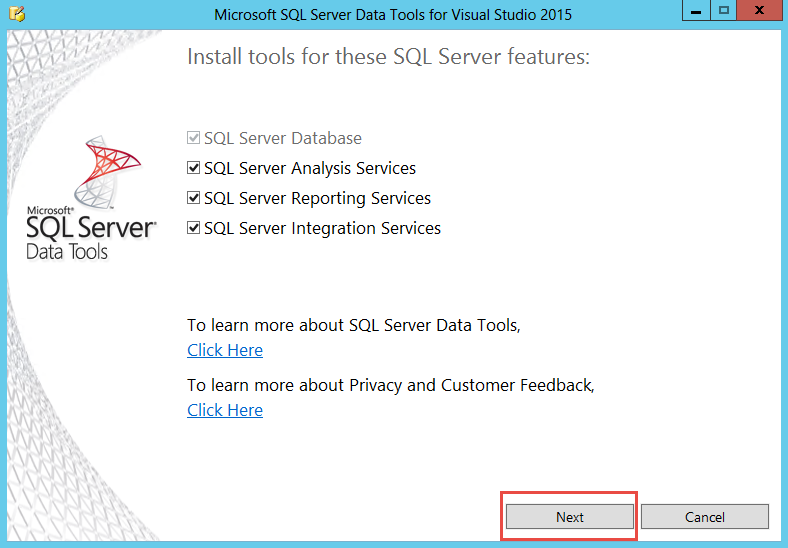 Clicking on the Download SQL Server Data Tools for Visual Studio 2015 here! 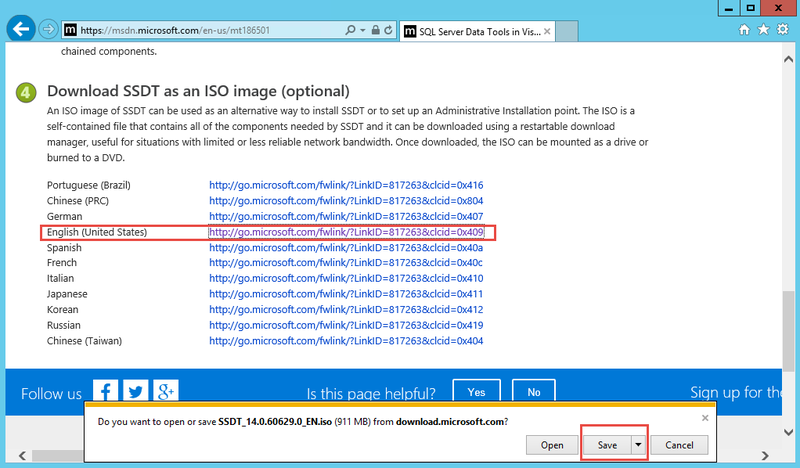 will display the second download page that you can see in Figure 3. This page enables you to optionally create an installation point on a network share or you can simply scroll down and select the download image you want to install. In Figure 3 you can see that the English language image has been selected. You will then be prompted to open or save the ISO image. By default, saving the SSDT_14.60629.0_EN.iso image will copy it into the system’s Downloads directory. After the download completes clicking Open launches a Windows File Explorer window which will have expanded the ISO file. Then you can run the SSDTSETUP.EXE program to start the SSDT 2016 setup process that you can see in Figure 4. The first SSDT 2016 installation screen enables you to select the different features you want to install. By default all of the boxes are checked. Clicking Next displays the Microsoft Software License Terms dialog that you can see in Figure 5. 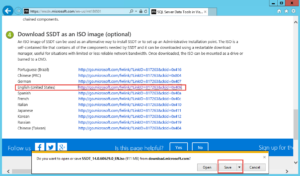 Check the I agree to license terms and conditions box and then click on Install to begin the SSDT 2016 installation process. 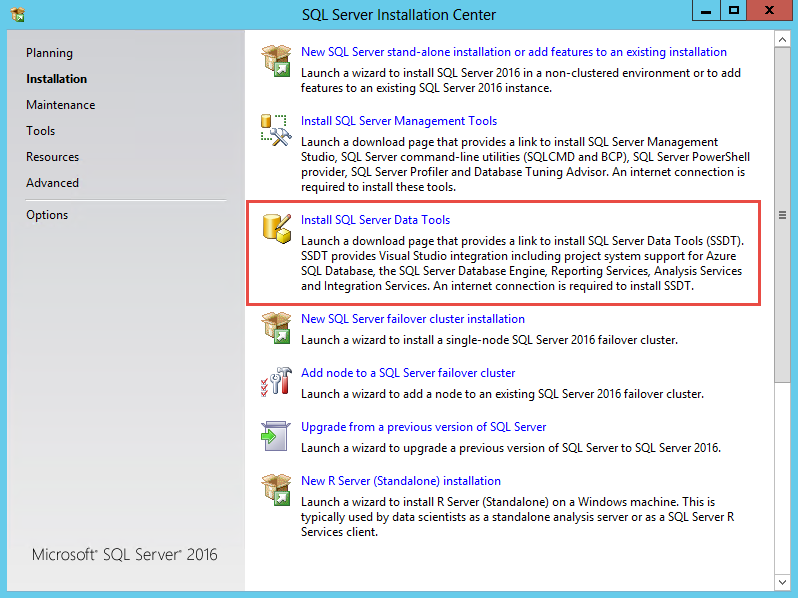 The installer will run through a number of steps including installing SQL Server LocalDB, the SQL Server DB OLE DB Providers and the Microsoft Visual Studio 2015 Integrated Shell. When you first open up SSDT 2016 you get to choose your Visual Studio color theme as well as the type of development environment you want to use. The default color theme is blue and the default development environment is general. 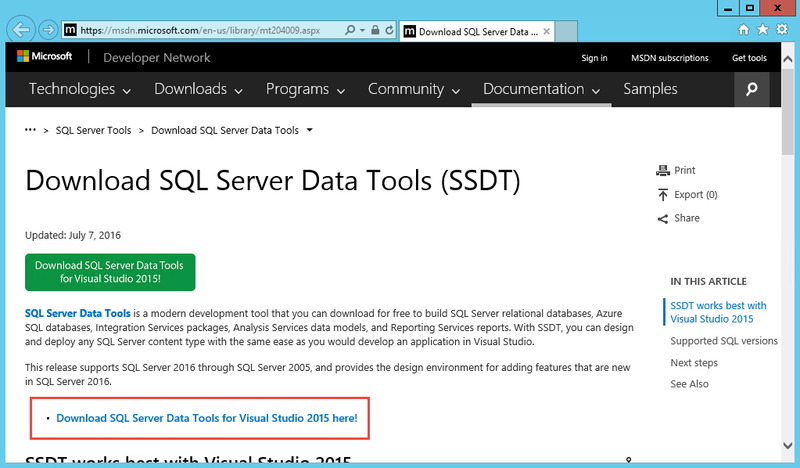 When SSDT 2016 first launches it will open the SQL Server LocalDB instance. You can then connect to your other SQL Server instances. Selecting the File, New, Project option will display the SSDT project templates that you can see in Figure 6. To start a new project simply select one of the templates and give it a name. 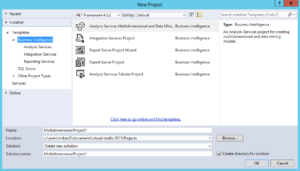 SSDT will add a new project to the Solutions dialog and you can begin working on your BI project. I have SQL2016 (engine+SSMS) and VS2015 and VS2017RC. I ran the SSDT installer hoping to get BIDS templates in VS2017RC (as “update” because is detected in my VS2015) but didn’t work. I’m now trying reinstall (update actually) of VS2017RC with the SQL checkbox checked. Fingers crossed that doesn’t get frustrated by my A/V (either that or sleep/hibernate made it hang last times). Please uninstall that “exit intent” spammy popup window thing. That has to be the most annoying thing going around these days.